Though The Two Towers ended with Frodo and Sam in high spirits, the final act is where Gollum begins to display his more conniving side. Jealous of the strong friendship the two have, Gollum acts amicable towards Frodo while secretly attempting drive a wedge between him and Sam. Most of the time, this kind of plot is irritating because you’re hoping for the main character to see through the obviously untrustworthy person and put them in their place already. Like many of the familiar fantasy tropes displayed in the story up until this point, The Return of the King goes to great lengths when it comes to justifying why the plot pans out the way it does. Gollum effectively winning Frodo’s favor has less to do with him being a skilled manipulator and more because of the One Ring’s influence. The ring is destined to corrupt all who bear it, and in the end, even the best people aren’t immune to it. As such, it’s understandable that Frodo isn’t going to be making good decisions as long as it remains wrapped around his neck. The biggest turning point in their journey is when Gollum tricks Frodo into believing that Sam ate all of their rations. When Sam offers to hold the One Ring for Frodo, the latter believes he wants it for himself, and orders his friend to go home. This allows Gollum to lead Frodo right into the lair of a giant spider – Shelob. Sam, being the good friend that he is, eventually realizes he had been fooled and follows Frodo’s trail, culminating in his greatest moment. When the orcs capture Frodo, having been paralyzed by Shelob’s venom, Sam unflinchingly marches straight into the Tower of Cirith Ungol, killing every single one standing between him and his friend. What I like about this conflict is how it’s not as bombastic as the war campaign led by Aragorn, yet it’s every bit as tense – possibly more so given that there is only one proficient fighter between the two and they’re venturing past the forces of Mordor. At the same time, you never get the sense that Frodo is useless. The injuries he accumulates over the course of the story in addition to bearing the extreme burden that is the One Ring means he isn’t able to do much else other than continue forward. In most stories, a character like him would be entirely superfluous. What The Lord of the Rings does is deconstruct and justify the presence of such a character, making him tragic rather than unnecessary. Elsewhere, Aragorn has an extra incentive to win the war against Mordor. His elven lover, Arwen, is on her deathbed, having refused to leave Middle-earth. Only by resolving this conflict can she be expected to make a recovery. Though there arguably aren’t quite as many subtle story beats to be found in his story, it is no less deep. Despite their victory at Helm’s Deep, Mordor threatens to launch a counterattack against Gondor. If they seize the capital city all is lost. The war has reached a point where they must recruit the Army of the Dead to have any chance of winning. The Dead Men of Dunharrow were cursed in the distant past by Isildur due to abandoning their oath to him in his time of need. They now haunt the caverns beneath the Dwimorberg. This development serves one of two purposes. The most obvious is to underscore just how desperate Aragorn’s campaign has become. These ghosts have spelled the downfall of any adventurer foolhardy or unfortunate enough to encounter them, and Aragorn must convince them to join their cause. His recruiting of the Army of the Dead also symbolically allows him to repent of his ancestor’s sin. Isildur had the opportunity to destroy the One Ring, but kept it for himself. Not only is it why Frodo’s perilous journey is necessary in the first place, it caused Elrond, the Half-elven Lord of Rivendell, to lose his faith in humanity. Aragorn, who is inheriting this terrible legacy, began the story hesitant to become king out of fear of becoming a tyrant. It is by rallying the Army of the Dead that he accepts the inescapable fate his ancestry has imposed upon him, but with a newfound sense of determination to steer his fellow man in the right direction. The culmination of his character development is punctuated when he declares the sprits’ oath fulfilled, allowing them to move on to the afterlife at long last. As was the case with The Two Towers, I enjoy how the narrative continues to give every single surviving member of the Fellowship a purpose. While Merry and Pippin were largely in the background in The Fellowship of the Rings, they began to pull their weight in The Two Towers when they caused Saruman’s downfall. The Return of the King continues their arc by separating them early on. Because they were rarely seen apart in the previous two installments, it was interesting getting to see them accomplish wildly different feats of bravery throughout this one. Merry’s crowning achievement is when he, along with king Théoden’s niece, Éowyn, takes down the Witch-king of Angmar. Meanwhile, Pippen is the one who rallies an alliance of neighboring nations to fight against Mordor by lighting Gondor’s Beacon. It’s hard to believe they were the same troublemakers who set off Gandalf’s fireworks when all is said and done. Finally, it must be said that the friendly rivalry between the elf Legolas and the dwarf Gimli is enjoyable as well. It’s particularly amusing when they continue it in the middle of these sprawling war sequences. By the end, Gimli has come to respect Legolas as a friend, though it takes him some time to admit it. Even with these incredible fight sequences, the final leg of Frodo and Sam’s journey still manages to stand out. One of the easiest traps this film could have fallen into was to make their arrival at Mount Doom less exciting than the war that preceded it. Once again, Peter Jackson proved he knew what he was doing. To begin with, it’s clear that the journey has taken its toll on Frodo and Sam when they near their destination. The entire time, you will be worried they could drop dead at any moment, exacerbated by fact that they have completely depleted their rations. 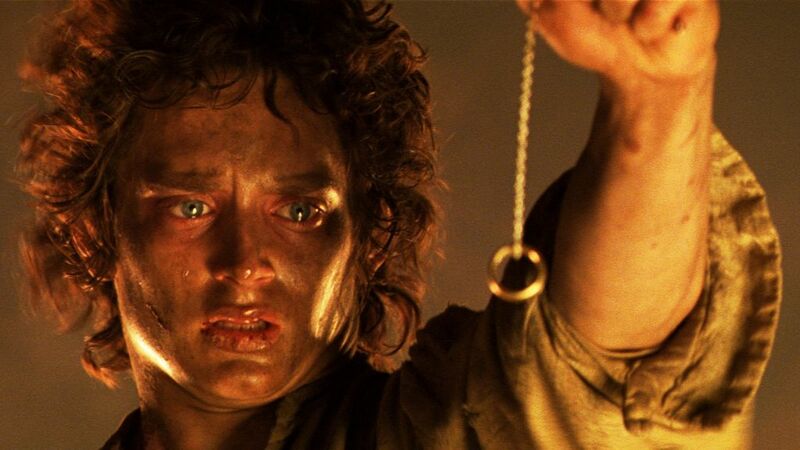 This reaches a pinnacle when Frodo is standing over the magma and declares that he wants to keep the ring for himself. This moment hits home just how evil the One Ring is. Prince Isildur falling under its influence could be chalked up to human folly, yet even the pure-hearted Frodo cannot resist it. He was the chosen one and he failed in his mission. The moment he dons the ring is equal parts horrifying and bizarre. The Fellowship of the Ring firmly established that using the ring would draw Sauron’s attention, yet when he focuses on Frodo, his eye betrays a sense of sheer dread. It’s highly surreal watching this terrifying force of pure evil outright panic, though it’s perfectly understandable given the context; he found his ring only to learn that it’s in the one place on Middle-earth in which it can be destroyed. Before Sauron can even do anything meaningful with this knowledge, Gollum accosts Frodo, determined to take his precious treasure back. He manages to retrieve it, but slips and tumbles into the fiery abyss. There are many fantasy stories in which the hero shows mercy on an enemy. This, in turn, rewards the hero in some tangible way whether it’s by causing said enemy to make a legitimate effort to become good or freeing them from their cell when they inevitably get captured. With The Return of the King, J. R. R. Tolkien put an interesting spin on this basic concept in that Gollum never sees the light. There is a brief moment in which Gollum would appear to have a change of heart by reverting to his old persona, Sméagol, but it doesn’t stick. When he gets the ring he doesn’t care about or even seem to be aware of his imminent demise. As long as he has been reunited with his treasure, nothing else matters – not even the fact that he has only seconds to live. Fittingly, Gollum’s obsession with the One Ring causes both entities to be incinerated. The ring seems to futilely resist its fate, impressively carrying out the standard villain death trope despite being an inanimate object. It holds out for a few minutes before melting into the magma. What I particularly like about this sequence is how much it plays with the audience’s expectations. One is ready to assume sparing Gollum was a fatal mistake seconds before learning that it is the very reason why their mission is able to succeed at all. Frodo was the chosen one, yet he failed in his mission. Only through a combination of blind luck and factors he couldn’t control was the ring destroyed. Regardless, the end result is the same; with no means of revivification, Sauron is doomed to spend the rest of eternity as a spirit of malice, unable to influence anyone or anything ever again. Though Frodo and Sam marched into Mount Doom assuming their expedition was a suicide mission, they are thankfully rescued by Gandalf and his eagles. Aragorn is crowned the new king of Gondor with Arwen as his queen, the hobbits return to the Shire, and Frodo writes a book about his adventures entitled The Lord of the Rings, supplementing Bilbo’s There and Back Again. Four years later, Frodo departs Middle-earth for the Undying Lands alongside Bilbo, Gandalf, and the Elves, knowing that things cannot return to the way they once were. He bids his friend farewell as the ship leaves the port. If it’s one final compliment I can pay this film, it’s that I really like the contrast between the endings of these plots. Frodo’s journey, while dark, was less perilous compared to the war Aragorn fought. Despite this, the tone of these endings are almost polar opposites of one another with Frodo’s journey ending on a bittersweet note and Aragorn’s hellish tribulations culminating in a triumph. One common criticism of The Return of the King is that the ending is needlessly drawn out. However, because The Lord of the Rings is a single story told over the course of nine hours, I think a long ending was necessary to lend a true sense of closure to every single one of its main characters. An epic story deserves an appropriately elaborate ending, and I can safely say The Return of the King allows The Lord of the Rings to successfully stick the landing. The Return of the King was a sheer anomaly upon its 2003 release. Merely being a fantasy film beloved by fans and critics alike wasn’t what made it unusual. Over the decades, countless classic films such as Alien, Star Wars, and The Terminator would be singled out by scholars as exemplary works of science fiction or fantasy. However, while possessing a degree of staying power most works lack, if you examine the Academy Award ceremonies the year following these films’ release, you will notice not a single one of them won. This was a common theme with the ceremony; no matter how good these works were, you could count on the Academy to turn up their noses and shun anything outside of the decidedly narrow scope of what they considered good every time. That all changed during the 76th Academy Awards when The Return of the King found itself nominated for eleven accolades and proceeded to win every single one of them. An unabashed high fantasy film now jointly held the record for the largest number of Academy Awards won along with William Wyler’s Ben-Hur and James Cameron’s Titanic. In short, The Return of the King was such a well-made film that even a group of people who normally disliked the genre had no choice but to acknowledge its brilliance. Granted, it accomplished this without having been chosen as one of the top ten films of 2003 by the National Board of Review, but it’s still a remarkable testament to its quality. Even ignoring the sheer number of awards it won, The Return of the King stands to this day as one of the best films of the 2000s. It’s easy to get the impression that, like Titanic, it won a majority of its accolades solely by being a visual technical marvel when such a conclusion couldn’t be further from the truth. The Lord of the Rings was easily one of the most influential novels of its day, and the success of its film adaptation in the early 2000s demonstrated the story’s ability to transcend generations. Indeed, because Gary Gygax and Dave Arneson’s equally influential tabletop board game Dungeons & Dragons took numerous cues from The Lord of the Rings, Mr. Tolkien was indirectly responsible for pioneering an entire genre of gaming: the role-playing game (RPG). As a result, I can imagine there are certain pockets of fans who still haven’t seen or read The Lord of the Rings simply because they’ve experienced one of the countless worked it doubtlessly inspired and feel it would have nothing new to offer. However, I liken The Lord of the Rings to Seven Samurai because while its legacy speaks for itself, it features countless nuances that weren’t copied endlessly. Indeed, a running theme throughout the trilogy is that Mr. Tolkien went out of his way to justify what would eventually become standard fantasy tropes – almost reading like a deconstruction of the very genre he codified. It is for these reasons and more that I can declare The Lord of the Rings one of the greatest stories of its time, and Peter Jackson’s adaptation nearly five decades later one of the most significant triumphs in film. I agree. It was really cool seeing everything wrap up. This story really stuck the landing. Yup! I also loved the design of the white city. That whole battle was structured really well, i thought. Best in the trilogy, and one of my all-time favorites. As much flak as I give the Academy Awards (and I feel it’s deserved), they totally got it right when this swept everything. Some people say it was more awarding the whole trilogy, and while there may be some truth to that, I think RotK deserved the same treatment even on its own. It’s a masterpiece. Although there have been a number of movie trilogies/series in my lifetime, this is the one that actually felt like I went on a journey with it. The sense of genuine finality in this entry has still never been approached for me (I love the Dark Knight trilogy, and certainly like Rises more than many, it seems. But even it didn’t give the sense of “this is the end of the journey of a generation” that RotK did). Not even gonna lie, I cried when I first saw it in theaters at a few different parts. I think it’s the only live-action movie where I cried in the theater (I bawled my eyes out for Schindler’s List, but seeing as I was only three when it was in theaters, I didn’t see it until my adult years). Although I’ve always loved movies since I was a tiny wee lad, the 2000s really had a big impact on my love of cinema. Spirited Away had the biggest impact, of course. But the Lord of the Rings trilogy, the Pixar films of the time (especially The Incredibles) and The Dark Knight all really helped shape me and my views of cinema (Even Sam Raimi’s Spider-Man trilogy left a lasting impression). They also helped me greater appreciate movies from my past (such as Who Framed Roger Rabbit, which has since become one of my favorites. And this only increased my love of My Neighbor Totoro). I always loved movies, but this era made me a film buff. I agree completely. In all honesty, the 9/10 I awarded this film really should’ve applied to all three entries, but I decided awarding more than one 9/10 to what amounts to a single film split into three parts would’ve been cheating. 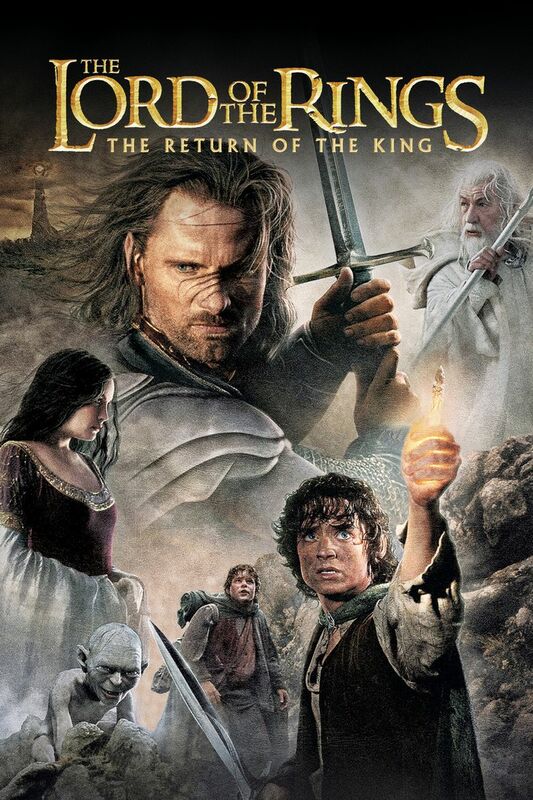 Even so, I can say The Return of the King deserves the 9/10. Yeah, the Academy Award ceremony, to me, come across as conservative as all get-out, which is why I’m still stunned that they christened The Return of the King Picture of the Year back in 2003 (or The Shape of Water Picture of the Year earlier this year, for that matter); just to prove it wasn’t a fluke, it proceeded to win all eleven awards it was nominated for. No film has ever made me cry, and The Return of the King is no exception. However, I can say this film came way closer than most; that ending was quite something. Also, I do think Rises gets a tad more flak than it deserves, though I can understand why people don’t like it. Then again, given Heath Ledger’s untimely demise, a lot of its shortcomings really weren’t anyone’s fault. I was really hit-or-miss when it came to watching films in the 2000s. It wasn’t really until the 2010s that I began regularly seeing the films critics were hyping. Therefore, I have to say there really wasn’t a specific decade or film that I can point to when it comes to my formative years when it comes to how I’ve developed my current taste in films. I feel I can use this to my advantage because it means I’m not really biased in favor of (or against) anything. Hopefully, that’s the impression I give off as I review more films. I’m glad everyone enjoyed these films so much, but they bored me a bit. I just couldn’t get into them. I think large chunks of New Zealand might agree. That’s too bad; I’d say the loss is yours. I think you should give them another shot somewhere down the line. Maybe watch them in chunks at home? Yeah, I shall give them another whirl, I shall. Rings can corrupt a person – be It the one ring or a wedding ring. Good to see the Academy acknowledge this kind of film for a change. I always roll my eyes at how lazy they are when it comes to the animation category. For that matter, I’m still stunned they christened The Shape of Water Film of the Year back in February. There was a meltdown on Twitter as a result. I couldn’t help but chuckle because we, as gamers, praise stuff with way weirder premises on a regular basis. This is a medium in which a plumber going around fighting turtle-like creatures is considered perfectly normal. I find it highly fitting that The Return of the King won eleven awards. I kind of want to check out Ben-Hur now; I got a copy some time back, but never got around to watching it.